As a recently certified welder, I have been thinking deeply about my own choices of what kind of work I want to apply for. I am certified as a ‘structural welder’ by the Canadian Welding Bureau which boasts the highest standards when it comes to structural welding. I can choose to work with any small or large company that have need for welders to weld things together for good! For example, I have applied to work as a welder for maintenance of BC Ferries, another example would be working with Marine Worker’s Union No.1 for a company that belongs to under the banner of Seaspan. Working in the shipyards would be a unique experience and one that I would welcome. Everyday in the news we hear about Port Expansion and development, I am learning about these issues, about our economy and where the jobs are for British Columbians. There are three reasons I chose to go into welding. To use the skill of welding in the field of art, to apply it to creating public art and to work with other artists. The second reason I chose it is to have the ability to make more than ‘the living wage’ (which is 18.00/hr). The third and last reason, is that I wanted to challenge myself personally, to learn a practical skill that I could build on and get better at by practice. I look forward to working within the marine environment and hope to use the certification that I worked hard to attain. I am supporting the Dogwood Initiative because I will be a part of helping to conserve and preserve the Fraser River Estuary, the wetlands and marshes, and the coastline in general. I have decided that conservation is more important than development and prosperity. At the same time, I think that we can have a decent balance between the two. In the weeks ahead up to election day, I hope to have ongoing conversations with friends, neighbours and co-workers to further educate myself and continue to consider the near future, to understand what expansion and development means for BC’s coastline, so I can make informed choices for my livelihood for the environment and future generations. The title might insight you to think of the bygone days of youth when you were free spirited and did not think about the consequences of your choices or actions. The phrase was spoken to me as I crossed the fancy intersection at No. 1 Road and Moncton. It was just the two of us there, even though there are eight different ways to cross we just happened to be crossing on the same side at a specific moment. He was a ‘come from away’ or cfa as they say in Nfld. Not of the Vil, just a visitor. He had a favorite cafe that he frequented and now he was crossing on the red hand, before the white man appeared. I hesitated. Looking at the lights, the corners, the myriad ways before me of crossing one of my favorite intersections. It got me thinking about living dangerously. To look at a stranger, greet someone whom you don’t know with a smile, or look a person straight in the eye and say, hello, how are you, really, tell me. This isn’t living dangerously, or is it? It is a common occurrance, a kindness given. On the subject of welding, I came to the conclusion that although it is ‘dangerous’ as a job and pursuit, I put it on the same level as mothering and caring about people. I think to live dangerously is to care about people since it requires the most from us. I am learning the only way to make a good join that is industructible is to pay close attention to every angle, to the placement of the weld bead, travel speed and correct amp temperature coupled with a immense steady patience that gives you enough time to run the length of the rod into the metal are some key components. I make parellels between the two realms for the reason that I know about mothering and caring for people. I see a similarity where the inherent commitment involved in bearing and caring for a family like learning the trade of welding, is nothing short of life threatening and unpredictable. Welcome to the first day of ‘The Journey’ the instructor said. Five women and seven men sit in room 102 at UAPICBC on our first day of orientation. I am in a covert operation beginning with strangers who embark upon a voyage of work, dedication and pure determination to learn and train ‘to be’ welders. Indulge me for a moment, you know I have imagination! I travel to far away Annacis Island through an industrial corridor which puts me in the mood to learn about welding and the industry. At the moment I am public transiting which is its own kind of curious experience, except if one is sleeping! 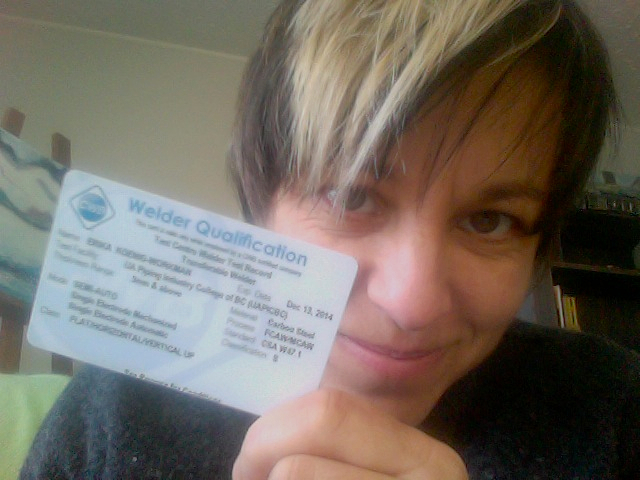 It is a journey worth embarking upon and I have all confidence that I will learn ~e ssential skills for welding and life! In 37 minutes with Sandra Bilawich, I view her shop in the beautiful rough hewn urban industrial setting of the Downtown Eastside of Vancouver. I like women who like to work, weld and express their life and art through working with stone and metal. Attentive to the telling of whatever the material asks while listening to mathematical formulas, applying endless experimentation with knowledge of how materials will behave helps complete an artwork, its no small endeavour. I say goodbye and thank her for allowing me to intrude upon her work schedule. I ask myself again: What do welding and mothering have in common? In welding there are predictable outcomes and results. In mothering — Is it a crap shoot or an act of faith? The common element in the two endeavors are this: the intent is to join and form a strong bond between the two sides which first have to be prepared for joining. —I [will] keep the faith as Sandra said upon parting. On my way to piabschool for an intro to plumbing, gasfitting, steamfitting, sprinkler fitting and welding. It is an intro to the intro of the beginning of the beginning! I have lots to learn but am looking forward to new challenges. All I asked was the door be opened and so it has a crack! What lay ahead only providence knows….